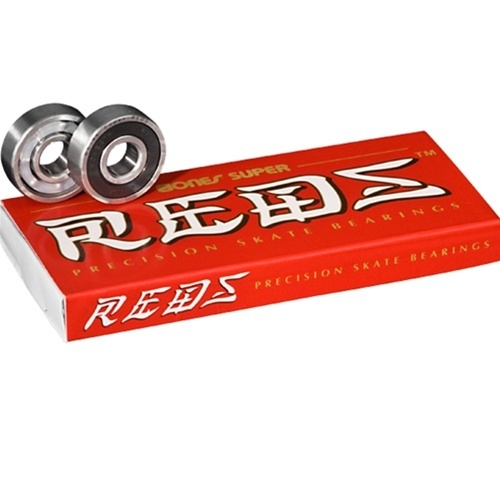 NEW Bones Super Reds bearings in 8 pack Regular 608 bearings. 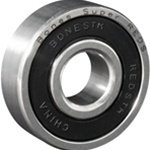 Bones Super Reds are designed from the ground up to be the best bearing on the market for the price. In fact, we don't think any other bearing can challenge Super Reds until you step up to the Bones Swiss pricepoint. Super Reds are not just a Reds bearing with better super finishing (surface polishing). Super Reds are a superior quality bearing, using higher quality steel races, better grade balls, and a superior surface finish. The result is a bearing that is as fast as Reds, but quieter, smoother, and longer lasting. Super Reds use a black shield and laser engraving to differentiate themselves from original Reds, and are packaged in a new red and gold 8 pack box. Now, savvy skaters who buy Reds will get even better performance and value from Super Reds. Be scammed no more by the false ABEC 5,7, or 9 ratings: Get Super Reds for the same price! We think you will be amazed when you skate the new Super Reds, because they are very close to Bones Swiss for about half the price. In any case, whether you continue to choose Reds, or upgrade to Super Reds, they now have another Skate Rated choice, at a price point about midway between Reds and Bones Swiss. 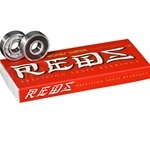 - Super REDS are designed from the ground up to be the best bearing on the market at this price point. What Super REDS are not, is a REDS bearing with just better super finishing (surface polishing). Super REDS are a superior quality bearing, using higher quality steel races, better quality and grade balls, and a superior surface finish. The result is a bearing that is as fast as REDS, but quieter, smoother, and longer lasting. Super REDS use a black shield and laser engraving to differentiate themselves from original REDS.